Know of an unemployed farm dog? Many of you know Bo, our old Australian Shepherd, who so faithfully hung out at the front of the store. Bo died Thursday. Although we are sad to lose him, it's been hard to see him so ill. Bo's passing leaves a big job to our other dogs. With cows, horses, goats, and chickens to watch over, we always knew to take it especially seriously if Bo barked in the night. We need to find another farm dog. I know we ask a lot of a dog. He has to be a perfect gentleman with literally thousands of people who visit the store, never showing any aggression or unease, but alerting us if they venture too far, like into the house or barns unescorted! He has to be beyond kind and considerate of our 9 grandchildren. He can't chase cars or horses but will occasionally be asked to shoo the chickens off the deer corn we have for sale. He needs to live outdoors and not stray off our property into the deadly road out front. In return, it's not a bad place to be a dog. Someone is always outside. August to January, our dogs get continual attention in the form of throwing the ball or just a pat on the head from all our dog-loving customers. In the quiet months in spring and summer, there's trucks to ride in and woods to romp in. He or she would live at a meat plant, enough said. We'd love to have another Australian Shepherd but would consider a German Shepherd, golden retriever or a mixed breed. We've not had good luck with hounds as they find the allure of woods with no fences too much to ignore. If you know of a dog, young or old, looking for a job and a loving home, contact us. Collins Moe got a 12 point! Eleanor and Craig Wilkerson celebrated her first deer tonight! Mason Sease joined the Cordray's First Deer Hall of Fame! Bill Johnson got a 122 lb. 8 point with Troy and Billy. Jack Ellenberg brought in a deer with his entourage of Briar, Britton and Banks! Robert Faith and his daughter stopped by with her first deer! Brian Gainey and family came in to celebrate his wife's first deer. She used a bow to take her very first deer! So sorry I missed your name. Send it in and I will repost! Bryson Smoak got his first deer and got dunked by Jimbo Smoak! Looking for a unique Christmas gift? Try Cordray Farms Certified SC Grown long sleeve T-shirts. Available in Clemson orange, USC garnet, navy blue, and brown. Children sizes in bright red. The venison and wild hogs that you ordered to be ready in time for Thanksgiving are ready. I will try to get reminder calls out but don't wait to hear from me! If you asked that we have it ready in time for the big day, it is done and waiting on you. 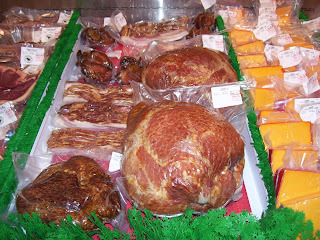 We also have all the reserved applewood smoked pork hams ready for your pick up. We made a few extra and cut some in half. Pick up a ham and some bacon and eggs for your Thanksgiving breakfast! Open 9 to 9 today and Wednesday. Closed all day on Thanksgiving. We'll reopen on Friday morning at 9 am. Chad Blevins joined the Cordray's First Deer Hall of Fame! Stephen Bowen got his first deer! Kim Hunt got her first deer! Jeff Ferraro got his first deer and got dunked! Jason Tidwell brought in a big buck with Brad Frazier.